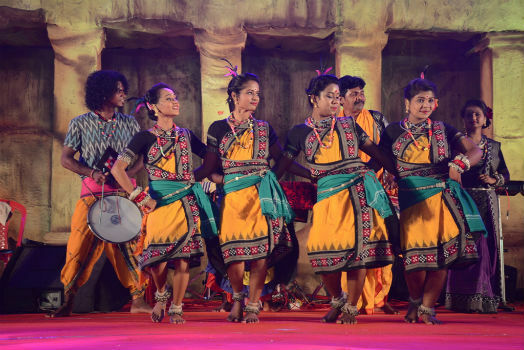 Bhubaneswar : The 3rd evening of “Khandagiri – Udaygiri Mahotsav” organised by Tourism Department in association with Department of Culture, BMC and BDA stated with the fusion of Odishan classical and folk dances such as Sahi Nacha, Sambalpuri dance, Boita Bandana and popular Odia/ Hindi songs by the popular renowned artistes. The programme was attended by Shri Pradeep Kumar Amat, Hon’ble Speaker, Odisha Legislative Assembly. Amongst others, Shri Ashok Chandra Panda, Hon’ble Minister Tourism & Culture, Local Corporators and other invited guests were present. Today’s evening first programme was Sambalpuri Dance by the artistes of Rangapharua. Their presentation was Jaiphula and Rasarkeli followed by Utkala re Utkala and Boita Bandana by Mokhsha Dance Group. Next item was Sahi Nacha performed by the artistes of Puri Sahijata Dance Group. 3rd evenings last presentation was Odia and Hindi Melody by the Ollywood Singing Sensation Satyajit Jena and Barnali Hota. The visiting tourists also enjoyed the local delicacies in the Food Court participated by 15 reputed hoteliers. ORMAS has put up 10 stalls where Self Help Groups are participating with their products along with exhibition of Boyanika. Other agencies like OIMSEAS, ASI, State Museum, State Archives, Khadi Board, Tourism stall, Lalit Kala Academy have displayed their products in the exhibition. The Sand Art display performed on the occasion by Padmashri Sudarsan Pattnaik, international famous sand artists attracts huge tourists in general and local visitors in particular.